You can play Ticket to the Stars slot from Quickspin for free now. It’s typical 5 reel slot with wild reels and cascading wins. There are 25 pay lines. The top paying symbol is a pilot, and it pays 20 times your stake for a full line to add unlimited multiplier during free spins, and you have a way for you to conquer a big win Ticket to the Stars. 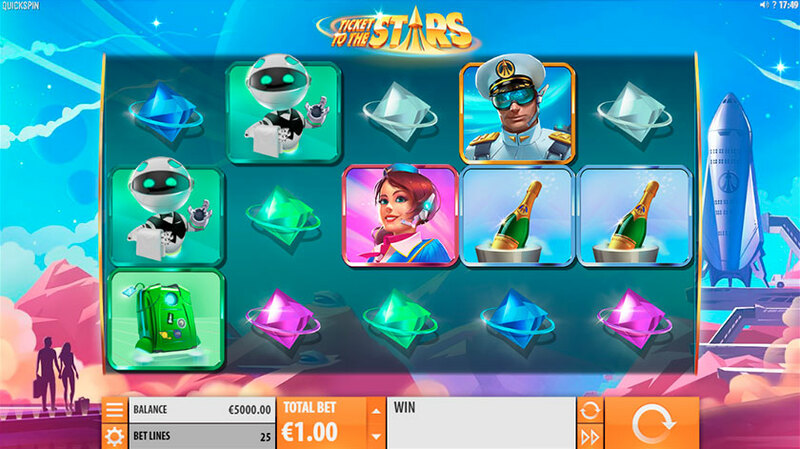 Try Ticket to the Stars slot for free now and enjoy its amazing bonus game. You can play now Ticket to the Stars and try to get at least a couple of bonuses in demo mode to test it properly. To start your free spins on the ticket the stars, you need to catch three bonus symbols, more symbols you catch, more free spins. During your free spins on Ticket to the Stars every time you land a line of at least symbols you advance and upgrade your multiplier. 3 wins equal one extra multiplier and 2 extra free spins. Don’t forget about wild reels if you get two of them in reels 1,2 or 3 there is a guarantee that you upgrade your multipliers and get many extra spins. I like this slot, it looks interesting, and 10,000x win is so promising. Also, I like that you can actually win something during the base game. The bonus game is also can keep you satisfied. Try this Ticket to the Stars for free now and play for real money in one the best online casinos.